LANCASTER, Ohio — Jim Gerkin’s signature will be showing up on 2,500 Christmas cards this year, but that doesn’t mean this AEP retiree has drastically expanded his personal Christmas card list. Gerkin’s artwork, though, is brightening the holiday season for quite a number of the residents in Lancaster, Ohio — particularly those who remember when its business district bustled with four movie theaters and a wide array of retail stores. “Memories of Christmas Past” — a watercolor painting by Gerkin that shows a wintry view of downtown Lancaster in the 1950s — adorns the cover of the Christmas cards that the Fairfield Heritage Association has been selling as a fundraiser for the organization. 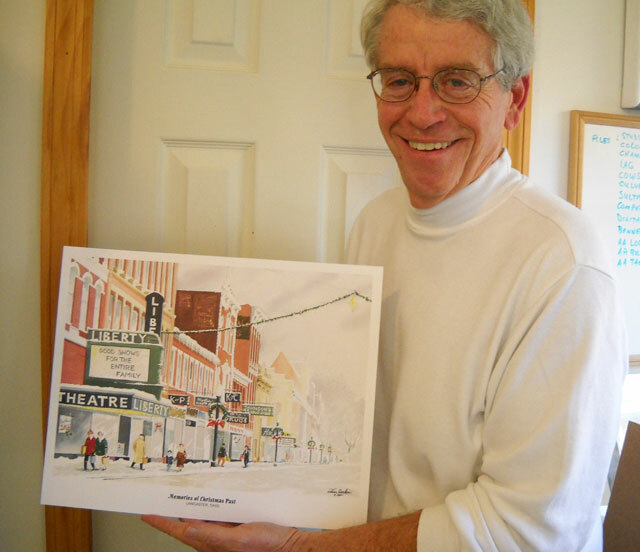 Gerkin has created hundreds of watercolor paintings over the years, but he admits that re-creating Lancaster’s Main Street in the 1950s “was one of the most exacting and time-consuming paintings that I’ve ever done. The Fairfield Heritage Association contacted Gerkin in the spring and asked him if he would help with the fundraising project. The association wanted to have the cards ready for sale in time for the Fairfield County Fair, held in early October. Once a "kitchen-table artist," Jim Gerkin now does his painting in this comfortable 24-foot by 32-foot studio located behind his home at the edge of southeastern Ohio's Hocking Hills. A graduate of West Virginia University, where he earned a bachelor’s degree in art and a master’s degree in instructional design, Gerkin has been always partial to watercolors. “I’ve always thought they were very special,” he said. For years, he focused on painting landscapes, including scenes of farms and, in particular, barns. “People would ask me why I paint old barns and I would tell them, ‘because they’re going to be gone,’” he said. Most of his inspiration comes from scenes in central Ohio, West Virginia, Maine, and the Chesapeake Bay region. Gerkin’s watercolor of his niece won Best of Show honors at the Central Ohio Watercolor Society’s 2011 Spring Show. In this particular painting, the young girl appears to be in the midst of an exuberant laugh, with her head flung back. Jim Gerkin describes himself as a "realist" who "finds paintings" everywhere he looks. "I love to create beautiful paintings based on the things I see around me every day," he said. “The key to a good representational watercolor is a good drawing,” Gerkin emphasized. The New Martinsville, W.Va., native does a detailed pencil sketch of the subject before he begins applying paint. Much of the realism of his paintings is due to his meticulous attention to elements such as shadows and the reflections of images on water. But this AEP retiree has been cheered by the fact that two West Virginia galleries recently decided to display and sell Jim Gerkin originals. “I now have my work in the Pocahontas County Artisan Gallery in Greenbank and the Fourth Street Gallery in Marlinton — eight paintings in one and seven in the other. Both locations are near the Cass Scenic Railroad and there’s a lot of tourism in the area,” he said. 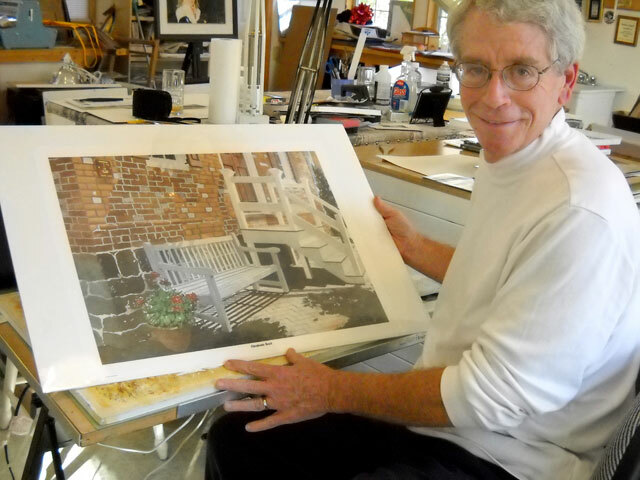 Active in the central Ohio arts community, Gerkin is a member of the Lancaster Art Guild and the Central Ohio Watercolor Society. 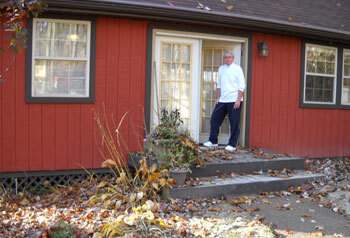 He is a past president of the Lancaster Active Artists and a regular contributor to the annual Lancaster Art Walk. He is one of a group of artists who went together to start the Monarch Studio, which is currently in the midst of moving to a new location in downtown Lancaster. What’s next in his artistic career? Gerkin recently began teaching a class of five students in what he terms “beginning watercolors.” The group meets one night each week in his studio. “Years ago, I had a teacher and mentor — Columbus artist Leland McClelland, a talented painter in his own right — who was greatly instrumental in my development as an artist. He’s no longer with us, but whatever technical skill I have comes largely from his teaching and coaching. In the meantime, there will be about 2,500 Christmas card recipients this year who will be exceedingly glad that Jim Gerkin learned those lessons well. I knew Jim professionally when I used to work at Southern Ohio Coal Co. but had no idea that he is such a talented artist. I appreciate you very much for writing this feature about him. Moreover, such stories would enable us to reconnect with our old friends and colleagues through this medium. I wish that you had posted the photographs of his paintings as an attachment which would have enabled us to enlarge them and look at them in more detail. Please convey my warm regards and best wishes to JIm for continued success with his work.